A plate of appetizers is considered a meal. Don’t load up on appetizers and then sit down to a full meal. Survey all of your food options before beginning to eat. Choose a few of your favorites and then fill the rest of your plate with greens. Liquid calories count. Stick with only one calorie-filled drink and then switch to water. Eat a sensible meal before you arrive at the party. This will cut down on party food calories. Let’s explore the following 7 ways to politely turn down Holiday food that’s pushed on you by well meaning friends and family. Why stalling works: By not directly turning the food pusher down, they feel that they’ve won and will drop the subject. Later you may decide that you want a small portion of the offered food, or you may decide to skip it. Why being stuffed works: No one can refute your statement about being full. If your food pusher is persistent then let them know that having one more bite would make you uncomfortably full to the point of pain. Why having a diet restriction works: Even the pushiest people are likely to back off when they hear you have a diet restriction. The key is to be consistent. If you say that you aren’t eating gluten then don’t reach for a bread roll. Why spreading it around works: You’re not making a scene, and quite frankly, no one is going to notice. When food is put on your plate without your consent you are under no obligation to eat it. Spreading the food around is a simple way to defuse the situation without eating something you didn’t want. Why saying they’ll get a break from cooking works: Every good host wants to send their guests home with something, but given the option they’d love to have leftovers for themselves as well. Compliment their cooking and let them know that you think they deserve a break over the next few days. Why wanting to live long works: Said with good humor, this drives home a serious point. You are watching what you eat so that you will be around for many more holidays to come to enjoy with your loved ones. No one can deny the importance of this! By warding off food pushers you’ll eat fewer calories and will avoid holiday weight gain to start the New Year off right! This recipe is very flavorful and is filled with wholesome nutrients, vitamins and fiber. Unlike most teriyaki recipes, this doesn’t contain sugar, yet it maintains a sweet undertone. Serve on a bed of baby arugula and quinoa. Combine the soda, soy sauce, vinegar, minced onion, garlic, ginger and coconut crystals in a bowl. Add the chicken and turn to coat. Place in refrigerator overnight. Remove chicken from marinade and pat dry. Reserve 1 cup of marinade. Heat one teaspoon of coconut oil in a large skillet. Add the chicken and heat on medium high, turning once, for 8-10 minutes, until browned and cooked through. Transfer to a plate. Wipe out the skillet. Heat remaining 1 teaspoon of coconut oil. Add the sliced onion and asparagus. Cook for 5 minutes, until browned. Add the reserved marinade and boil until slightly reduced. Add the cilantro. 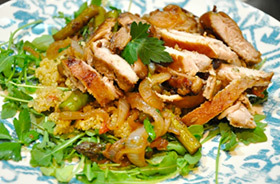 Serve over a bed of baby arugula and cooked quinoa. In order to make healthy eating choices a no-brainer, empty out your kitchen of any and all junk food items. Throw out the processed, sugar-filled and carbohydrate-rich junk food items that have been contributing to your weight gain. Now replace all of the junk items with healthy replacements. Whole, fresh food items like fruit, vegetables, lean protein, eggs, seeds and nuts. The closer an item is to its natural state, the healthier it is for you. Stay clear of “health food” that come packaged and processed. Well, how’d that work for you? Did your weight drop on command, or did it not budge? And yet you spend your precious time obsessing about your weight as if you had control over it. The good news is that you do have control over a couple of important things that influence your weight. I’m talking about your choices regarding what you eat and if you exercise. Your current weight is the sum result of your history with eating and exercise. Close your eyes and think back over the last three years of your life. What kinds of foods did you eat most often? How intensely did you exercise, and how often? Now open your eyes and look at yourself in a full-length mirror. You are looking at the result of your past choices. If you like what you see then keep on eating and exercising the same. It’s working for you! I choose to eat wholesome foods that nourish my body. I choose to only eat when I’m hungry and to stop eating when I’m full. I choose to not eat junk food, sugary drinks or sweets. I choose to eat a variety of fresh fruits and vegetables every day. I choose to get up early in the morning, when I could be sleeping, to invest an hour of my time in exercise. I choose to be consistent with my workout schedule, giving exercise the same importance as a doctor’s appointment. I choose to change my workout routine often, to always keep my muscles guessing. I choose to push myself to new levels of intensity, in order to strengthen and tone my muscles. There’s no reason to spend another minute obsessing about the number on your scale. You’re smarter than that. Instead focus your energy on the choices you make regarding what you eat and how you exercise. Remember, I’m here to help you meet your fitness and weight loss goals. Call or email today to get started on a fitness program that will quickly bring you to your goal. 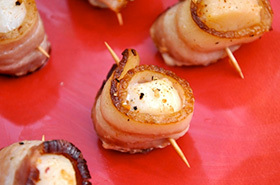 This is a great snack or appetizer to enjoy this holiday season. It’s especially important this time of year to stick with food that is made with real, wholesome ingredients. In a medium bowl combine the minced mint, salt and pepper, lime juice and agave nectar. Add the melon balls and toss to coat. Place in the fridge for 15 minutes. Fold each slice of prosciutto twice, so that the width gets smaller. 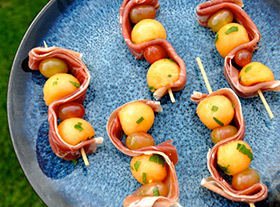 Push the prosciutto onto a skewer, add a melon ball and a grape, then fold the prosciutto over and repeat with another melon and another grape. Repeat with the remaining ingredients. If your family gatherings normally revolve around food, it’s time to begin a new tradition. Take the focus off of food, get people away from the buffet table, and do an activity that everyone will enjoy. Play a game, make a holiday craft, dance to your favorite holiday tunes, play a motion-based video game, go ice skating, build a snowman, or go sledding. Food and drinks…high-calorie food and drinks, that is! No wonder most people gain weight during the holidays. Everywhere you turn, you’re surrounded by sweet temptations – holiday cookies, gingerbread houses, pumpkin pies, and more. Even healthy foods like sweet potatoes and green beans are magically transformed into high-calorie dishes that will make you want to do nothing but fall asleep. And don’t forget the drinks. Eggnog and alcoholic beverages are loaded with calories. Yes, the holidays bring yummy foods and drinks, but friend gatherings and family traditions aren’t about food. Before a party, remind yourself what the holiday season is all about – friends, family, giving, and religious traditions. Then stay focused on the reason for the season rather than the plate full of hors d’oeuvres in front of you. Second, stay focused on your dieting goals. Remind yourself of where you’ve come from and where you’re going. Keep your goals in the forefront of your mind. A few bites of food aren’t worth hours on the treadmill. Another important strategy is figuring out how to get in the gym between parties. Leaving room in your busy holiday schedule for exercise will help you fight off the extra weight trying to attach itself to your midsection and rear.